If you have an over-sized wheelchair or power scooter, there are a wide range of wheelchair lifts for vehicles to enhance your mobility freedom. From hoists to lifts, there is a portability option to help you prepare your vehicle for travel. Our 7-minute mobility guide will discuss available models along with the accessories you’ll need to complete the setup. Exterior wheelchair lifts for vehicles are mechanisms mounted to the outside of wheelchair-accessible vehicles that raise, lower, and secure larger wheelchairs and power scooters for transportation. They come in various sizes and designs that match your mobility device and the type of vehicle that you use. Wheelchair lifts for vehicles can also be mounted to RVs and motor homes for extended trips — a popular choice for retirees and road-lovers. Wheelchair lifts are available for sedans, SUVs, and full-sized and mini-vans. The first category of exterior wheelchair lifts for vehicles is lifts and carriers. These devices are mounted on the rear of wheelchair-accessible vehicle — or possibly on the front of RVS and mobile homes — and serve as docking bays for wheelchairs and power scooters. They are typically motor-operated, via a button on the side of the mount or keyless remote. Inside platform lifts. This device operates using a platform that lifts or lowers the wheelchair or scooter device into side-entry vans, rear cargo areas, or pickup truck bed. Outside manual platforms. This device operates using a platform that lifts or lowers the wheelchair or scooter device into side-entry vans, rear cargo areas, or pickup truck bed. Outside power platforms. This device operates using a platform that lifts or lowers the wheelchair or scooter device into side-entry vans, rear cargo areas, or pickup truck bed. If you have a smaller vehicle and would prefer a lifting system that takes up less space, hoists offer an exceptional option — and, in most cases, at a more affordable price. Wheelchair hoists use an external arm to lift and lower your mobility device. The next category of exterior wheelchair lifts for vehicles is the hoists. These devices are typically mounted on the rear bumper, trunk, or truck bed. They feature a one- or two-arm design — depending on the wheelchair or power scooter size — and connect to the chassis of the mobility vehicle. Hoists raise and lower via button the side of the mount or keyless remote. Inside boom lifts. This device operates like a crane and loads the wheelchair into the side-entry area, rear cargo area, or pickup truck bed. Once you’ve selected your lifting system, the next step is to consider various accessories that work in coordination to improve your mobility experience. There are a variety of accessories designed to enhance the operation and protection of exterior wheelchair lifts for vehicles. While some view them as an added expense, these lift, carrier, and hoist accessories serve specific purposes that extend the life of these high-dollar investments in your mobility freedom. Wheelchair lift devices are perfect for vacations in RVs and motor homes. AMS Vans carries an impressive inventory of exterior wheelchair lifts for vehicles to enhance your mobility freedom. We carry lifts and hoists that fit most wheelchair-accessible vehicles — including the installation services and accessories to get you up and moving quickly. 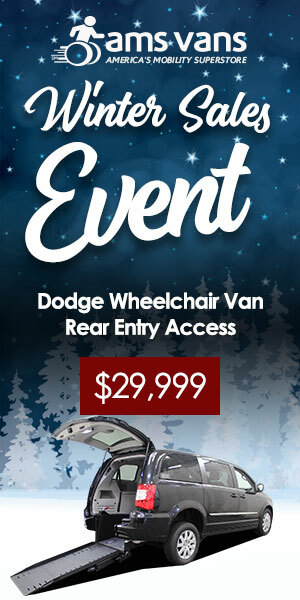 America’s Mobility Van Dealer is a national wheelchair accessible van dealer and manufacturer with a mission to deliver the industry’s best adaptable vehicles and mobility equipment that meets the unique needs of our customers at a price they can afford. This entry was posted in In the News, Technology, Wheelchair Accessible Vans on September 18, 2017 by AMSVans.